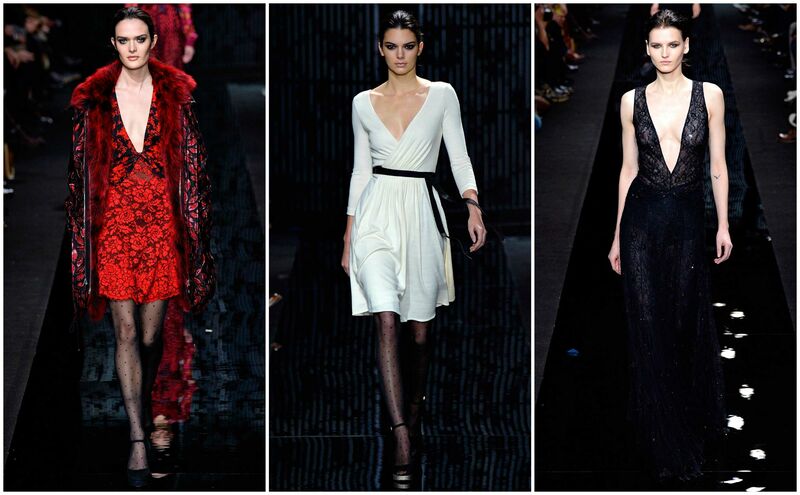 Diane von Furstenberg‘s tagline for this season’s Fall 2015 ready-to-wear collection is “By day she commands her world; by night she inspires fantasy.” That sentiment certainly rang true on the runway, which was opened by Kendall Jenner in a signature wrap-dress with a provocative black lace back. Diane von Furstenberg has become the iconic wardrobe for the accomplished woman. The looks displayed on the runway of her 2015 ready-to-wear during Mercedes-Benz New York Fashion Week included bold blue power suits, pinstripe separates, and provocative sheer black lace evening gowns. Rib-cage baring plunge necklines were seen across the runway. As opposed to designers such as Alexander Wang who made a statement with hair, a grunge stylization reminiscent of 90s Kurt Cobain, DVF’s models wore their hair in tidily-tucked buns with heavy eye make-up. The looks that worked the best were the styles Furstenberg is most comfortable with: the wrap-dress is as chic as ever. As the show concluded, Diane von Furstenberg enthusiastically greeted her audience with waves and a smile as Billy Joel‘s “She’s Always A Woman” played.